Camping Los Cameros is right in the heart of Parque Natural Sierra Cebollera, about 50 km south of Logroño, on the banks of the River Iregua. With plenty of land available, the campsite has modern facilities for a comfortable stay, for relaxing or for walking or horseriding in the area. Open all year. High Season: July to September, long weekends/bank holidays and Easter. Traditional Cameros area architecture, next to the Church in the highest part of Villoslada de Cameros. In the 1940s it was the Town Hall and municipal schools. The village shoemaker workshop stood on the mezzanine floor. It is not known with certainty, but, possibly, the original house was built at the end of the 18th century. Renovated, in stone, half-timbered, respecting its structure and traditional Cameros architecture as much as possible. Exceptional views of Sierra de Cebollera, where the source of the River Iregua is (Hoyos de Iregua). Many trekking routes through the Parque Natural. The holiday cottage EL Quemao ocupies part of what used to be the royal blanket factory, built in the 18th century for the production of wool. 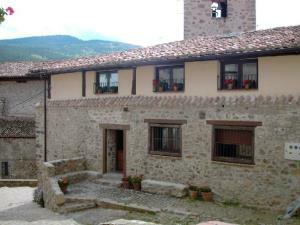 It has been restored using mainly materials form the mountains: wood and stone. Rustic-style, it has a comfortable lounge with fireplace. *High season: Easter, long weekends/bank holidays, July, August and Christmas. Renovated holiday cottage in stone and wood, respecting the ancient structure that fits in perfectly with the traditional architecture of the area. Decorated in a rustic style designed to seek maximum relaxation. Heating and hot water. Lounge with fireplace, fully equipped kitchen, 3 bedrooms, 3 bathrooms, games, reading area. Trekking, rural activities, knowledge of the environment, sports, advised or guided by the owners of the holiday cottage, if required. For horseriding lovers, the house offers accommodation for you as well for as your animals. Whole holiday cottage for rent with all the comforts possible, a dream home completely rebuilt on the site of a hundred-year old townhouse, respecting the architecture of the area. Ideal for 2-3 couples with children. 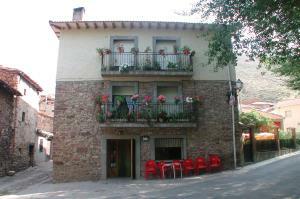 In the village centre, near: the square, the fronton (pelota court), bars and restaurants, the Nature Visitors Centre, bakery, pharmacy and the road to the Hermitage of Lomos de Orio. Posada de Hoyos de Iregua is a rural country retreat, with 12 rooms with full bathroom and heating, with a total capacity for 34 persons. 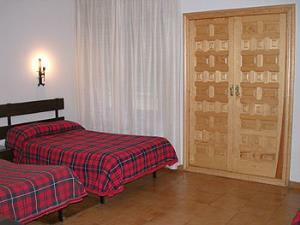 You will enjoy its wonderful views towards Sierra de Cebollera and the River Iregua. Possibility of extra beds in some rooms. Two rooms with Lounge, reaching an occupancy capacity of up to five people, ideal for families with children. It has a spacious 200 m2 lounges, suitable for meetings, conferences and cultural activities of different types. 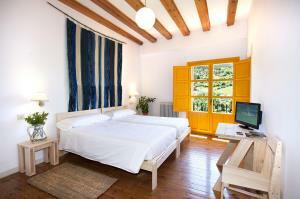 La Posada de Hoyos de Iregua offers accommodation, breakfast and dinner. Recently opened restaurant service offering lunch and dinner for the public in general. You can taste typical mountain-style and La Rioja dishes such as stuffed peppers, potatoes and chorizo stew, caparrones, local meat, all washed down with a good Rioja wine, and to end, a delicious homemade dessert. Homemade food in a select atmosphere, characterized by a smart combination of ingredients to prepare simple and delicious dishes. Offer complemented by various activities. Come and see for yourself. 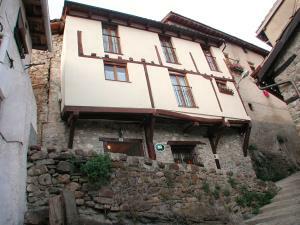 Renovated house more than 100 years old, maintaining the typical mountain architecture: masonry walls and wooden roof and framework. The ground floor was used as a blacksmith's and stables. Entrance from the Hermitage of La Soledad. Original Lounge distributed on two floors connected by steps; downstairs is used for breakfasts and upstairs as living room, with TV. The owners live on part of the ground floor and part of the top floor; the rest of the floor and attic are for the exclusive use of guests. They have direct access to the street by the rear façade. Peaceful walks among lush colourful forests and Mesta pasturelands. Wildlife and crystal clear rivers. Hear the bellowing of the deer from your room. 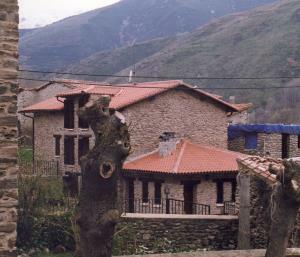 Explore the mountains and Picos de Urbión. Guided walks up to the top and routes on horseback through the valley. Family atmosphere and personalised service. Dinners available. 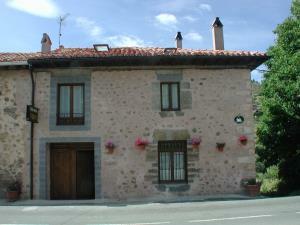 Hotel Goyo is in the town of Viniegra de Abajo (La Rioja). With 22 rooms equipped with everything necessary to make your stay enjoyable. Medical service, heating, garden, meeting room, parking and a bar, where you can have a snack or drink whenever you want. You'll find everything you need at Hotel Goyo to have an unforgettable holiday in Viniegra de Abajo. Whole house for rental prepared for groups of 10 to 12 PAX. It has 5 rooms, all fully personalized with two distinct environments: the bedroom and the lounge, separated by an annexe. On the ground floor there is a lounge with a fireplace to the right and a kitchen to the left, leaving the original cobbled entrance in the middle. Viniegra de Abajo is on the northern slope of the Urbión, which can be climbed using a high mountain path in 4 hours, for nature lovers. 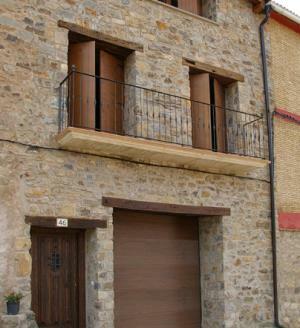 Viniegra is located in the heart of the transhumance region, 81 km from Logroño. The variant of the trail leads up into the highest parts of the region. Splendid landscape and sports facilities. Restaurant open to the public. Lunches and dinners served. 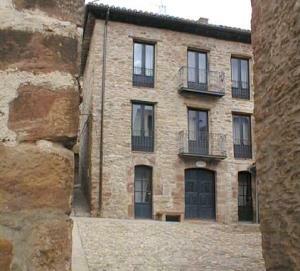 17Th century house that has been renovated respecting the old structure. 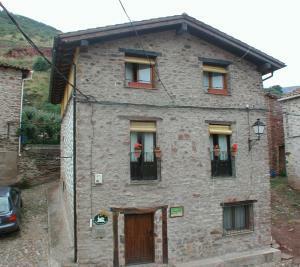 It has three floors and is situated in a part of the village with stunning views of the mountains and the River Oja. Independent entrance. Lounge with fireplace, library and garden. Village in Ezcaray surrounded by a landscape of unique beauty, highlighting Pico de San Lorenzo (on the slopes of which is Valdezcaray winter ski resort), varied landscapes (small valleys and villages among beech and oak forests) ideal for the hiking and mountaineering. Restaurant open to the public. Enjoy conversations around the warmth of our hearth, at this ideal getaway for groups in a rural wine atmosphere. Ideal for visiting the Route of the Monasteries, the Wine Route, the Via Verde path between Haro and Ezcaray or St James' Way. - Basement: An eating area for about 14 persons) consisting of a lounge, a dining room table, a kitchen with fireplace and a toilet. 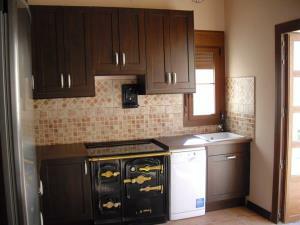 - Ground floor: A lounge-kitchen - dining room. In the hallway are two doors: one for the house and one for the eating area. In the lounge there is a fireplace. And the kitchen, the wonderful kitchen, where you will be able to remember times past.
. Bedroom 1: single room, bed of 1.35 m.
. Bedroom 2: double bed, bed of 1.60 m.
. Bedroom 3: twin room, two beds of 0.90 m.
. Bedroom 4: twin room, two beds of 0.90 m.
. Bathroom 3: washbasin, toilet and shower.
. Solarium: Consists of one area with relaxing armchairs and another with a round table with four chairs. THERE ARE MUNICIPAL SWIMMING POOLS VERY NEAR THE HOUSE. THERE ARE ALSO A FRONTON (PELOTA COURT), SPORTS GROUNDS AND SEVERAL CHILDREN'S PLAYGROUNDS.